Hi Mates. I've just about finished my new ft cruiser build. I've made it entirely out of blue FFF. It's light. I don't recommend this build for the faint of heart. I'll post pictures when it's finished. It should fly like a scared rabbit. It looks both cool and ridicules at the same time. I'll explain why when I'm finished. I can tell you one of the downsides of this build is the tracing and cutting out. It's time consuming and when your back aches from old age, like mine does, you find it rough. :black_eyed: it's the reason I've bought my kits instead of building off the plans. Downloading the plans, cutting them out, taping them together, etc., is hard on an old goat. But there's the anticipation in waiting too. Ok here's an unfinished version of the plane. I've since got everything on it except the wheels and electrics mounted. Other than that she's ready to fly. One other thing is this plane has fully symmetrical wings. She is a very pretty plane! now to find some light blue paper to cover the deck with looks good. BTW, has anybody ever hand launched this plane yet? That is a sharp and clean looking build. Very impressive! Thank ya thank ya. What I was talking about weird looking was the blue tape. It's marked as bedroom while the yellow tape is marked Kitchen. I thought they were solid colors when I bought them. They were shrink wrapped in a kind of opaque plastic so I didn't notice that they were pre-worded. I thought they were solid colors. In the future I'll buy my tape from tapebrothers.com. It's way cheaper and your get more of it and it's solid to boot, but of the same cellophane material. Knowing Blu FFF quite well, If your props are counter rotating the thing could probably use your hand for VTOL! It should do fine, but... Program your flap switch for some up elevator on launch, this will help. thanks for the tip. I figured I could just do a drop launch. I was wondering if anybody has tried a hand launch and how it worked out. I was gonna put retracts on the cruiser but when they came in they were way too heavy. So I installed kit axles and some nice, but small, wheels. 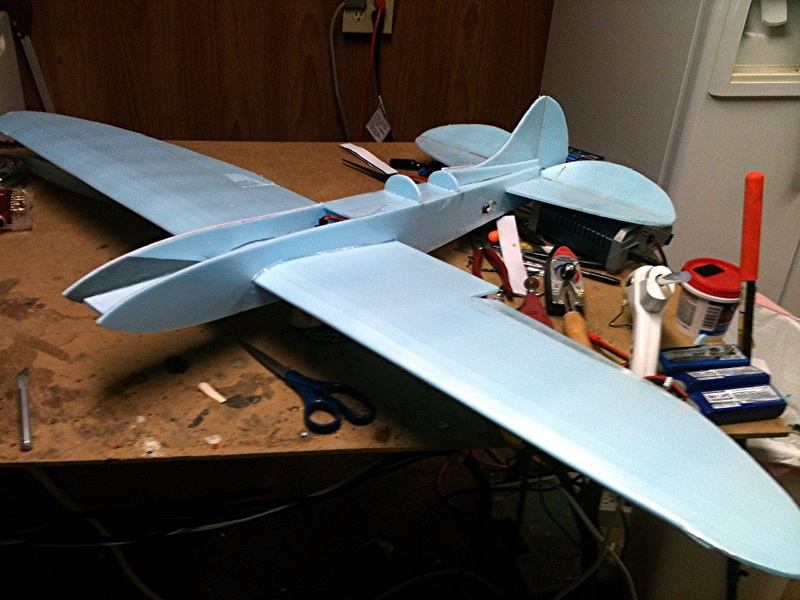 Anyway ... Good Lord willing I will be giving her a maiden flight. I'll post videos ... Assuming I don't end up in the walk of shame. Well ... Rats!! I forgot to install my Velcro for the battery. One funny tho', when I installed the props (tractor & pusher) I put 'em on reversed. Imagine my surprise when I fired it up to have the airplane try to go backwards. I was at an rc plane flight academy in Oshkosh Wisconsin, and 4 of us were fixing all the planes every night. One night, since there is a large truck sized door at one end of the mess hall, we decided to race 2 flyzone senseis. I had oiled some very bad bearings, and decided to bring my plane over without checking motor rotation.